Former prime minister and Labour leader Tony Blair has reiterated his commitment to reverse the British people’s vote for Brexit in 2016. “I am 100 percent opposed to Brexit,” declared the Iraq War architect at the Web Summit in Lisbon, Portugal — prompting spontaneous cheers and applause. “Up to the very end I am going to do everything I can to stop it,” he vowed. “I think it is possible to stop it… because it’s not in our economic interest, it’s not in our political interest; I think it weakens Britain, and it weakens Europe,” he added. Blair made the same arguments during the 2016 referendum, but failed to persuade a British public who backed Leave with a majority of well over a million votes — but the globetrotting multi-millionaire clearly believes this answer was not final. Blair has been a prominent voice for a second referendum since the vote to Leave the European Union, joining forces with other ex-politicians such as former Tory prime minister Sir John Major and former Liberal Democrat deputy prime minister Sir Nick Clegg — who has now given up the fight for a lucrative new job in California as Facebook’s global press officer — to lobby against Brexit, and holding closed-door meetings with the EU’s negotiating team. 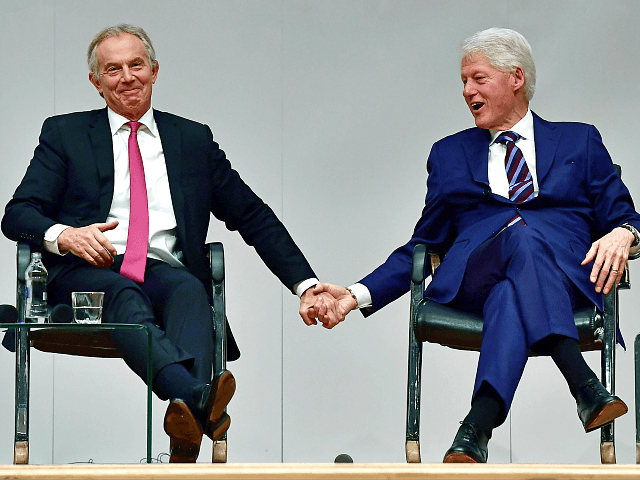 Few EU loyalists in Britain are calling for a simple re-run of the EU referendum, not least because most — including Blair, Major, and Clegg — said they would respect the people’s decision as final either before the vote, after it, or both. Instead, they are attempting to work around their own previous commitments by framing any second referendum as a so-called ‘People’s Vote’ on the terms of Brexit — with the whole thing to be called off if whatever deal Remain-supporting Prime Minister Theresa May and her Remainer-dominated Cabinet are able to secure is rejected, of course.